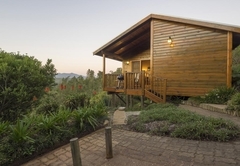 Best Accommodation for Self Catering in Knysna, Garden Route. 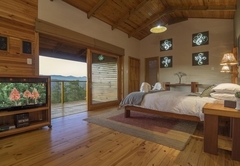 Voted Tops as a Honeymoon Venue. 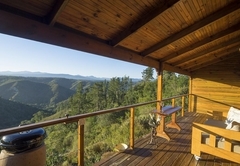 Cliffhanger Cottages is a highly recommended property providing self catering in Knysna for tourists visiting the Garden Route region. 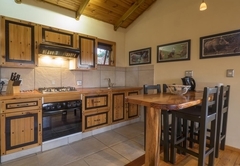 Cliffhanger cottages are situated along the Rheenendal Road and enjoy the peace of the unspoilt country and yet are only a 15 minute scenic drive on a tar road to the centre of Knysna. 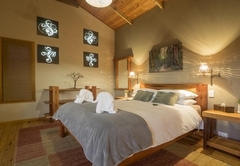 Each cottage only accommodates two people. 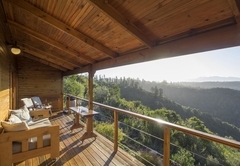 This is a luxurious self catering timber chalet perched on the edge of a steep drop into a forested valley with sweeping, unspoilt views of the Outeniqua Mountains. 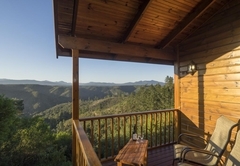 This is an ideal hideaway for honeymooners, lovers and nature lovers. 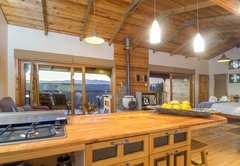 It is a very spacious chalet with one bedroom, bathroom with basin, w/c, bidet and a very large shower with a view. 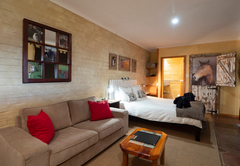 Open plan lounge, dining and fully equipped kitchen all warmed by a firepot on those chilly winter nights. 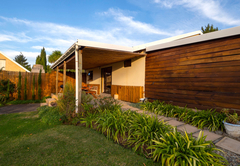 A covered and semi enclosed deck with weber braai completes the picture. The deck has a comfortable couch as well as chairs and side table. TV, HiFi, DVD and a satellite decoder (bring own smartcard) are provided. 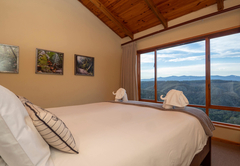 All rooms have large windows facing the panoramic view. 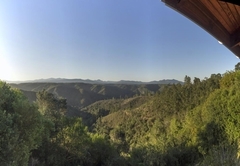 Cliffhanger is completely private, once there you could be the only people in the world. 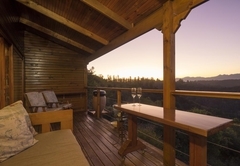 Cliffedge is a totally private luxury self catering timber chalet nestled on the edge of a forested valley with unspoilt panoramic views across the Knysna forest to the outeniqua mountains. 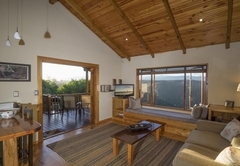 Cliffedge is an ideal hideaway for honeymooners, lovers and nature lovers. 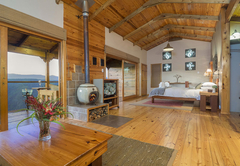 Comprising one large open plan living area with extra length queen size bed on one side and a well equipped kitchen and living area on the other side. A covered deck runs along the front . 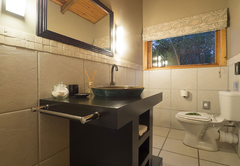 A bathroom with vanity and toilet and a huge separate shower facing the view completes the picture.A CD and DVD player, LCD TV and satellite decoder (bring your own smartcard) are provided. A firepot and firewood are supplied for those chilly winter nights and custom lighting provides a romantic atmosphere. 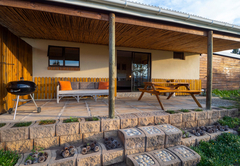 It has a well-equipped kitchenette, a bathroom with a spacious shower and a covered patio with a braai. 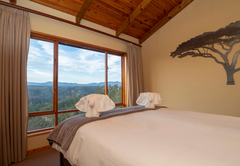 There are beautiful views from both the bed and the patio. 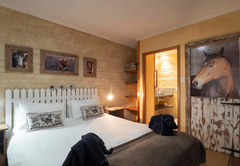 The unit is equipped with a TV, DVD, mini Hi Fi and a satellite decoder (bring your own smartcard). The Hedge Cottage is our budget accommodation in a lovely garden setting. 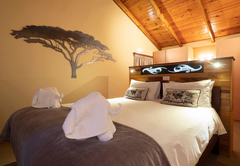 It is a comfortable bed-sit suitable for two people and makes an ideal base from which to explore the region. Buffalo Bay, a beautiful and safe swimming beach is a 15 minute drive away, and the Knysna forest only 10 minutes away. 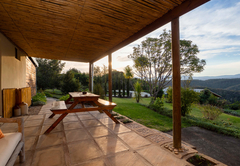 Birdlife abounds on the property and the loudest sounds you are likely to hear are the Egyptian geese or the Hadedah calling as they fly overhead. For the adventurous the possibilities are endless. Golf, fishing, boating, surfing, kitesurfing, paragliding, abseiling, elephants, monkeyworld, exotic bird park, ostriches, bungee jumps, parachuting, long breakfasts, lazy lunches, vibey pubs, rocking nightclubs and too much more to mention, all within easy reach on a days outing. 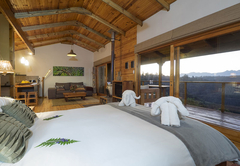 Cliffhanger is a spacious chalet with 1 bedroom, A bathroom with bidet and a large shower with a view. 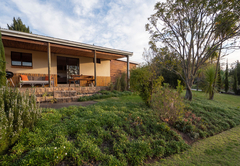 Open plan lounge, dining and fully equipped kitchen and a semi-enclosed deck with a Weber braai. 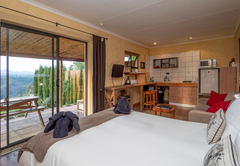 Cliffedge has a spacious open plan design flowing onto a full length deck, a large shower with a view, luxurious furnishings and a fully equipped kitchen. 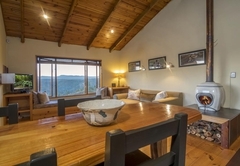 Cliff Edge Cottage has all you need for a fabulous break. Hedge Cottage is affordable accommodation in a lovely garden setting. 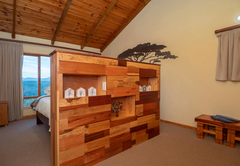 It is a comfortable and modern bed-sit, suitable for two people. It is an ideal base from which to explore the region. 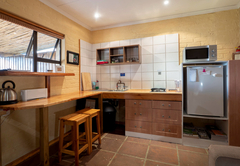 It has a kitchenette, a bathroom en-suite and a covered patio. 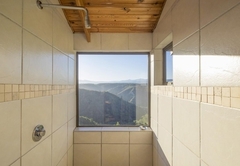 What an awesome experience; The cottage, the view, the shower, we will be recommending it and will most definately be coming back.. Response timeCliffhanger Cottages typically responds to requests in 5-10 minutes.